Ceremonial of Bishops presently in light of the post-Tridentine Caeremoniale Episcoporum [CE]. An analysis of chosen problems: lay Master of Ceremonies and his vestments. – I komu to przeszkadzało? It’s been 10 years since the publication of the motu proprio Summorum pontificum. A lot has changed since then, including the frequency of Pontifical Masses in the classic and dignified Roman rite which is visibly higher. There are several controversies connected with this fact. One of them concerns, so called, Episcopal Master of Ceremonies and, to be more specific, fulfilling the function (especially at Pontifical Masses) by laymen. I will try to respond to the title question basing on CE and other documents, as well as manuals of ceremonies and interpretations of acknowledged authors. 1. What CE says about it? CE says about the Master of Ceremonies in Book I, Chapter 5 (De officio magistrorum caeremoniarum). The following fragments are crucial for the issue in question: primus vigesimum quintum saltem attingat annum, sitque in presbyterali ordine constitutus (§1); Alter vero junior, qui saltem in sacro ordine sit constitutes (§3) oraz eorum habitus sit honestus et clericalis, ipsaque vestis inferior, ubi commode fieri possit, coloris violacei, super quam, dum divina Officia celebrantur, cottam mundam induent (§4). In other words, leaving aside other details included in CE: at least two Masters of Ceremonies should assist the bishop (in the cathedral – in his diocese); the first one should be a priest aged at least 25, the latter should have minor orders. Both of them are allowed purple cassocks. 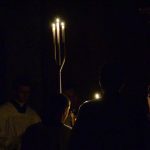 CE is not a liturgical book in a strict sense, but a kind of directorium including not liturgical rites, but rules that should be followed during their celebration, above all in cathedrals and collegiate churches. From the very beginning the intention of the legislator was not to limit the rules and regulations included in CE to bishoprics only, which should be, however, applied according to the rule of reasonable proportionality. Certainly, during ceremonies even the most detailed rules should be obeyed most scrupulously, also those that concern Masters of Ceremonies themselves. One should bear in mind, however, that old laws and regulations were formulated in a particular historical time and fixed in unambiguous and absolutely different common liturgical praxis. In view of more and more dubia appearing SCR issued several decrees regarding the Master of Ceremonies; still they didn’t change much in what had been written in CE. In the context of the problem in question: a Master of Ceremonies is allowed a purple cassock, yet not a velvet one; moreover fiocchi can’t be red. Usage of a purple cassock should be limited to functions described in CE (ex dispositione CE). It is also reserved for cathedral Masters of Ceremonies. A Master of Ceremonies is allowed to wear a purple cassock if the liturgy is celebrated by another bishop (with consent of the local ordinary), but it should be assisted by the cathedral chapter. 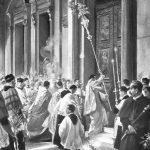 Until the liturgical movement and the liturgical reform of 20th century the above rules were a norm. The CE reformed after Vatican II says about the Master of Ceremonies in Part I, Chapter 2 (§§34-36), without giving any requirements neither for the state of the person fulfilling the function, nor for his age. In terms of vestments it states that a Master of Ceremonies should wear an alb or a cassock and a surplice – as one may notice, laymen are implicitly allowed to perform the function. On the responsibilities of an MC, CE from 1984 perfectly summarises and reflects the spirit of the rules of the post-Tridentine CE, putting a strong pressure on pastoral needs and tasks. Gromier states that an Episcopal Master of Ceremonies should be, obviously, a member of cathedral clergy; yet there are no obstacles for someone else to perform the function (including canons of a chapter, which is allowed also by DSCR) – “Question d’équilibre”. A Master of Ceremonies does not have to possess a major office, it’s only necessary for him to have necessary knowledge, civility and authority. Gromier also notices that the age requirement of 25 years for a cathedral Master of Ceremonies is too low, unless the candidate has a special talent and was guided by appropriate people in the seminary. He also highlights that the purple colour of a Master of Ceremonies’ cassock should not surprise anyone, as purple is the colour attributed always to the bishop, even if he wears a different colour during liturgies (e.g. when a bishop is a member of a mendicant order). Moreover, the tradition to allow episcopal trainbearers, archiepiscopal cross-bearers and even cathedral sacristans to wear purple is most commendable, according to the French prelate. Nabuco, enumerating all privileges connected with a Master of Ceremonies’ vestments, clearly states that Episcopal Masters of Ceremonies are entitled to purple cassocks due to the function they fulfil (ratione officii). In other place he adds that CE is, in fact, the ceremonial of the papal court (mostly the ceremonial written by Paris de Grassis) adapted to use in cathedrals and, as such, it has never had such a dogmatic and disciplinary importance as other liturgical books, especially the Roman Pontifical. Moreover, on the eve of the Vatican Council, in the times when the liturgical movement was developing, a new issue of CE was in preparation that, however, was never published; yet its new edition seemed utterly necessary. Pio Martinucci – the Prefect of Papal Ceremonies from 19th century – is the author of the most acknowledged manual of ceremonies: Manuale sacrarum caeremoniarum. Its renewed edition (fragments), adapted to the contemporary situation (liturgical books issued under the pontificate of John XXIII and Summorum Pontificum of Benedict XVI) was published in 2011. Three statements are of utter importance: 1) A Master of Ceremonies should be attached to the place where liturgy is celebrated (or at least should be familiar with local customs); 2) the First Master of Ceremonies should wear distinctive vestments during a liturgy, so that he could be immediately recognised by all its participants; 3) A Master of Ceremonies (contrary to a priest assistant) is chosen not because of his office, but his qualities; this is why the requirement that an Episcopal Master of Ceremonies should be a priest – as commendable as it is – is presently impossible to apply anywhere but cathedral churches, and even in the cathedrals themselves (taking into consideration the current liturgical praxis). This means that the function may be performed by a laymen (there are no requirements for a Master of Ceremonies to be a priest). In terms of a purple cassock: it is a privilege connected with cathedrals and so with the local bishop – a Master of Ceremonies (also a layman) may therefore use a purple cassock always when a liturgy is celebrated by or in the name of (with consent of) the local ordinary (by another bishop or cardinal – in the last case it is obvious, due to prerogatives and privileges the College of Cardinals is entitled to). CE, tradition, DSCR and the authors clearly and unanimously state that the (First) Episcopal Master of Ceremonies should be a priest or at least a member of clergy with minor orders (the second Master of Ceremonies). And it would be most desirable today, however (while preserving other rules and regulations): 1) CE is a book created in a concrete historical and source context; 2) CE does not have a doctrinal and disciplinary authority of liturgical books (especially of Pontificale Romanum); 3) the current liturgical praxis is completely different to the one the authors of CE were familiar with (the first edition in 1600, the last revision in 1948); 4) also liturgical and ecclesial spheres are absolutely different to those assumed (even implicitly) in CE and DSCR; 5) The function of an Episcopal Master of Ceremonies does not require in any way to be performed by a member of the clergy (it is knowledge and skills that are relevant); 6) vestments (a purple cassock with surplice or cotta and – depending on privilege – rochet or manteletta) is connected with the function (in this case: the Episcopal Master of Ceremonies), so even if it is fulfilled by a layman, he is entitled to the vestments; 7) Moreover, the bishop himself is entitled to the purple colour; this is why always when he chooses his Master of Ceremonies, the chosen person is given the prerogative (not because of himself but because of the bishop). The current state of affairs should be considered status quo (lack of a new, adapted to the current situation edition of post-Tridentine CE; rules of CE which can’t be followed any more) where one should follow the supreme law of the good (salvation) of souls and Pontifical Masses with (due to justified need and necessity) lay Masters of Ceremonies should be considered as such. Cf. G. Menghini, Elementa juris liturgici seu prolegomena in Sacram Liturgiam, Desclée & Lefebvre et soc., 1906, p. 34, no. 135. Cf. J. Baudot, Le Cérémonial, Paris, 1913, p. 46. Which is clearly visible in numerous manuals of ceremonies, especially those published in 19th and 20th centuries. J. Baudot, op. cit., p. 58. See (in a broader context): C. Barthe, La liturgie en plénitude, introduction in: Le Cérémonial des Évêques du concile de Trente à Vatican II, trans. A.P.M. Mutuel, P. Freeman, Paris, 2006, p. 3-12. A synthetic discussion of the issue based on DSCR can be found, e.g. in: Stercky [le Vavasseur, Haegy], Manuel de liturgie et cérémonial selon le rit romain, Paris, 1935, p. 543, note 1 and Haegy [le Vavasseur], Les fonctions pontificales selon le rit romain, Paris, 1904, p. 306-307, note 2 (quoted from editions available to the author). Among more common manuals of pontifical ceremonies one can refer to, e.g. Emmeran, Rettger [Stehle], Manual of Episcopal Ceremonies, vol. 1, New York, 2008, p. 101. It is difficult to say if they were obeyed everywhere and to the same extent (published DSCR are an implicit proof of occurring abuses). L. Gromier, Commentaire au Caeremoniale Episcoporum, Paris, 1959, p. 66. Ibidem, p. 68. Cf. J. A. Nainfa, Costume of Prelates of the Catholic Church according to roman etiquette, Baltimore-Maryland, 1926, p. 36-37 (the author gives more references; apart from CE, he refers also to, e.g. Le Vavasseur, Grimaldi and Barbier de Montault). 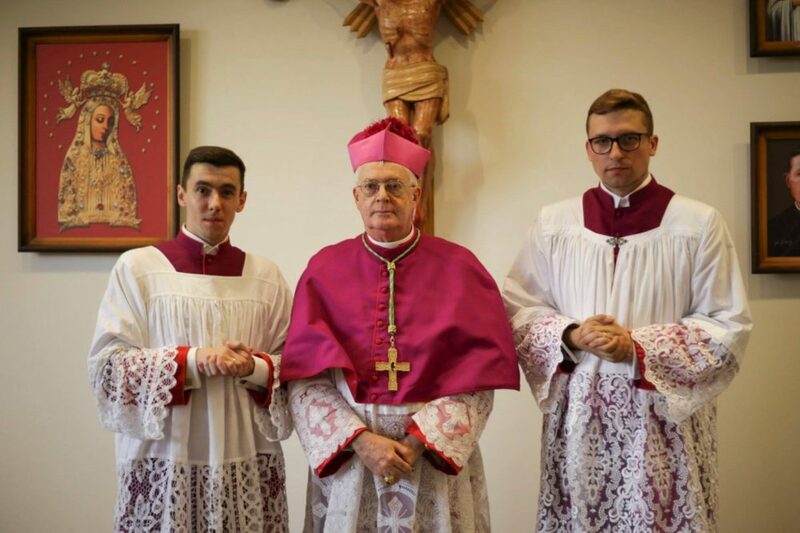 It is also a commonly known fact that papal altar servers (boys) and the choristers of the papal chapel (also boys) are allowed purple cassocks even today. J. Nabuco, Ius Pontificalium. Introductio in Caeremoniale Episcoporum, Tournai 1957, p. 126. J. Nabuco, La liturgie papale et les origines du Cérémonial des Évêques, [in:] Miscellanea liturgica in honorem L. Cuniberti Mohlberg, vol. I, Bibliotheca „Ephemerides Liturgicae” 22, Roma 1948, p. 292. Ibidem, p. 297. Many rules of CE were in those times obsolete, in discordance with the then law or even infeasible (Nabuco ironically notes that no bishop – and it was in the 50s of 20th century – when taking possession of a diocese, arrived to it on horseback). Its authority was comparable with this of SCR, cf. 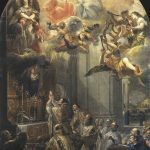 J. Nauco, La liturgie papale…, op. cit., p. 300. Martinucci mentions also a situation where the whole cathedral chapter would move to another church: if the ceremony were celebrated ex dispositione CE, then the Episcopal Master of Ceremonies also would be entitled to a purple cassock. Of course, a bishop could nominate more Masters of Ceremonies, also for celebrations away from the cathedral – these questions are described in details in DSCR and the quoted authors. In fact, if CE were to be strictly followed, one should consider not only the rules regarding the age, office and vestments of a Master of Ceremonies, but also other numerous precepts regulating and defining, e.g. certain days when bishop should (although he doesn’t always have to) celebrate Pontifical Masses. The 20th century reform of the liturgy, the issues of the “ban” and “return” of the Tridentine Mass, simplifications in the pontifical liturgy and other questions ex pontificalibus, (e.g motu proprio Pontificalia Insignia of Paul VI from 1968), etc. Cathedral chapters perform only a honorific function (is there a place in Europe where canons regularly meet in a cathedral to pray the Office together and perform other celebrations with the local ordinary? ), seminarians in cathedrals appear rarely (for major feasts and celebrations), etc. In other words, cathedral liturgy, pontifical liturgy as it was known before Vatican II and described by CE exists no more. The very form and contents of CE from 1984 are completely different to the previous editions of CE, which testifies to a certain rupture. Moreover, there is no place (taking into consideration also the diocese of Campos and the communities of FSSPX and Ecclesia Dei) where pontifical liturgy is celebrated in every aspect as CE and other liturgical books demand. It is highlighted by CE, authors of manuals as well as DSCR; it is also the case with CE from 1984. The question is discussed in details in the mentioned sources. It should be highlighted (after CE, the authors and DSCR) that eventually it is the bishop who decides who will be his Master of Ceremonies. However, the latter will be responsible for the conduct of ceremonies (CE I, 5, 2). This choice can be as well connected with circumstances, taking into consideration the small number of bishops [cardinals] celebrating Pontifical Masses and the vast number of places where such liturgies are celebrated. In the current, transitional period this practice is not only common but even necessary (an alternative would be to stop celebrating pontifical liturgies where the celebrants wouldn’t be able to adapt ad litteram to rules and rubrics given in CE; in light of this paper one should easily notice the absurdity of such a statement and its consequences). In other words: if the Master of Ceremonies is a layman (as allowed by the bishop/cardinal celebrant), denying him the privilege of bishops (the purple colour) would be a lack of respect and an insult towards him. An absurd thing. (Nota bene: 6 is genetically dependent on 7). The final regulation of the discussed question remains open – it lies within the responsibilities of appropriate Vatican dicasteries. CIC can. 1752 , cf. CIC can. 2168 . Once again it should be highlighted: given that in a particular situation all clergymen, especially the assistants to the Mass (or other liturgy), are so unfamiliar with the conduct of the ceremony, that they could not perform the function of the Master of Ceremonies.